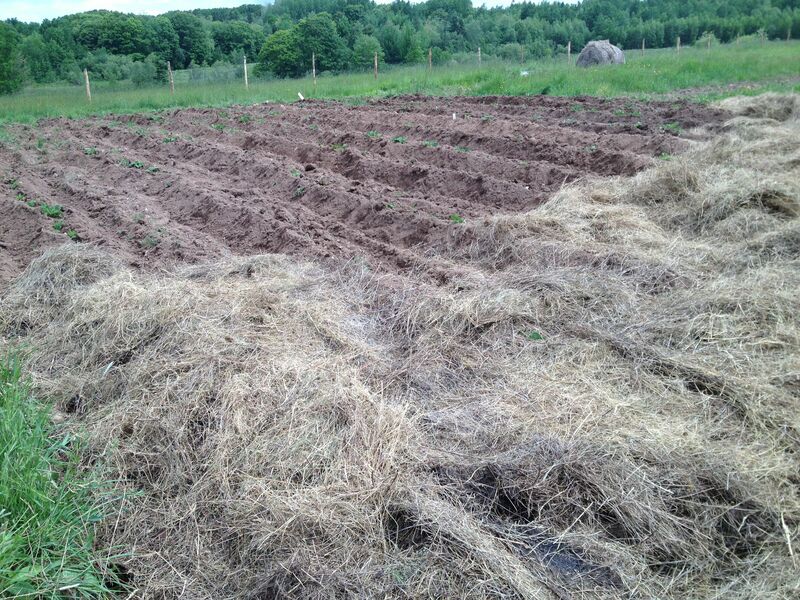 Potatoes are a big crop in the Maritimes. Most of us eat them. Our question is how to grow them organically and economically on a small scale. Here is an update from the potato patch. 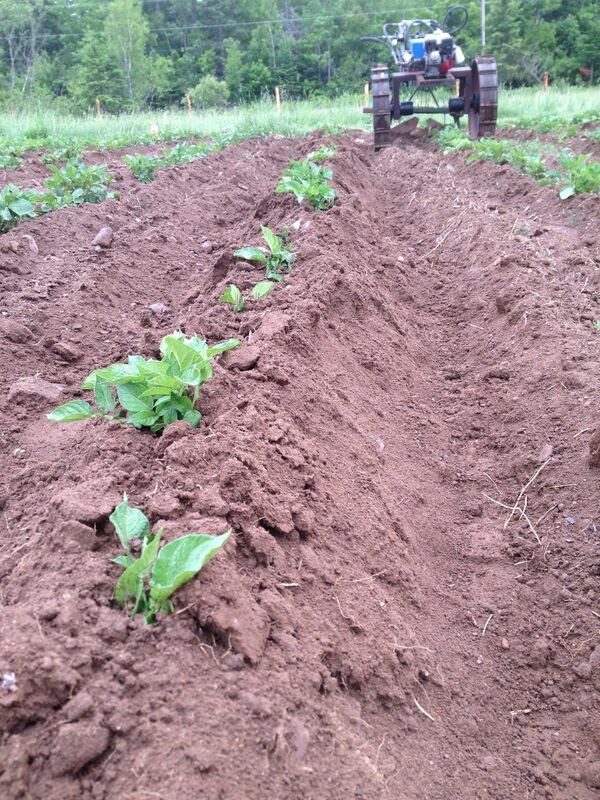 We planted potatoes in April, and David has been hilling them with a two-wheeled tractor. Hilling helps to control weeds, and keeps a good amount of soil over the tubers. After hilling, he and Bruce mulched them with old hay. A farmer we co-operate with had some waste hay he brought us. Waste hay may not be good for feeding livestock, but it represents a lot of organic matter. Mulching with it does two things: adds organic matter to the soil and moderates conditions for the potatoes. The mulch moderates or evens out temperature and moisture, which helps them grow better. Apparently moderating moisture also reduces the amount that pests are attracted to the plant. This is something I heard Eliot Coleman say years ago. Do other people have observations that support his statement?? 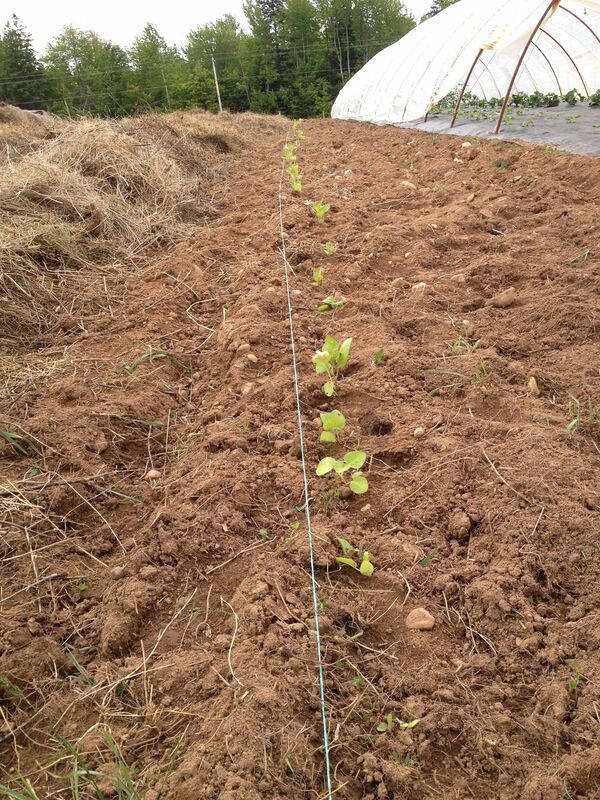 The 200 potato seedlings we planted from Raoul Robinson’s seed are now out in the field. They look very small! From this planting we will look for plants with disease resistance. We’re crossing our fingers. This entry was posted in growing vegetables, potatoes. Bookmark the permalink. Like so many things in farming, the answer to your weed seeds in hay questions is… it depends. In our case, the hay came from our farm and a neighboring farm with the same mix of weeds. This is significant since bringing in a nasty new weed species would be the number one concern. BTW, we did just that a few years ago when mulching garlic with supposedly clean straw that was contaminated with cleaver’s bedstraw, a most annoying and difficult to control weed that we seem stuck with for good in that field. In general, I think straw is the better choice if available but hay is better than nothing. That said, one year I just about lost my garlic crop because I used barley straw that was loaded with seed. I had so much barley sprouting in the spring that I could not keep up with it no matter how much I tried. Jen and I love what our hay mulch does for the soil. It seems to add a dark, sponginess that short-term cover crops and light applications of compost don’t. This year we are growing leeks where last year’s mulched potatoes were. The weed pressure is very light and the soil looks and feels fantastic. 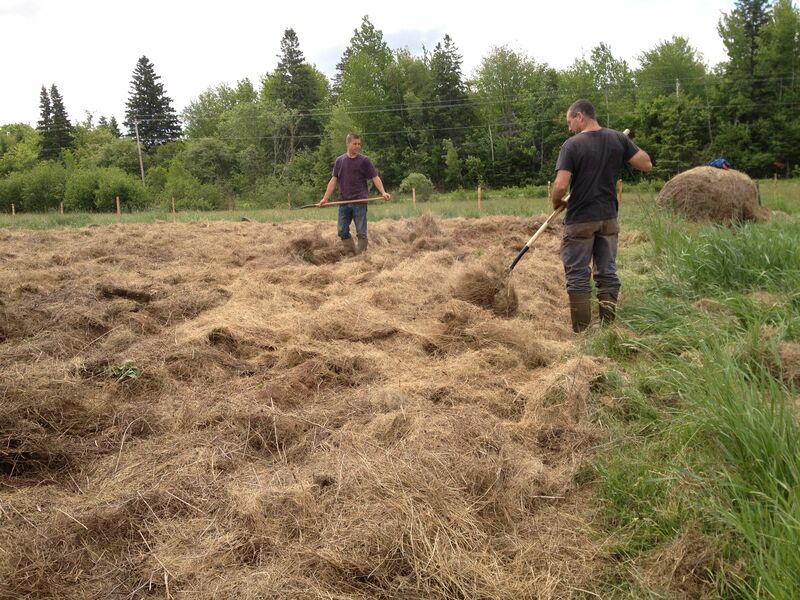 Thanks for your comment and I hope this helps to explain a bit more about our hay mulching. I’ll try and post a picture of the leeks soon. Thanks David, I think I will go with the better than nothing. It is our own hay so shouldn’t be any new weeds to introduce. Weeds are desparate this year and I am trying to cover everyhting that I can. Angela PS I gave away the stinging nettle plants to a gu in Cape Breton….will come and bum so more if you don’t mind.